As the cooler weather starts to set in we tend to turn to warm and comforting stews and braises. This recipe ticks all the boxes – easy to make, family friendly, creamy and delicious! I used a mixture of mushrooms, but you can simplify it and only use one variety. Serve stroganoff over long strands of linguine or pappardelle. For added texture, grill some prosciutto or pancetta until crisp, then crumble over the stroganoff to serve. My slow cooker has sear and reduce functions, but you can use a large deep frying pan to complete steps 1, 2 and 4 if needed. 1 Heat 1 tablespoon oil on sear setting in a 4.5-litre (18-cup) slow cooker. Cook eschalots and one-third of the mushrooms, stirring, for 5 minutes or until browned. Transfer to a bowl. Repeat twice with remaining oil and mushrooms. 2 Add wine to cooker and bring to the boil. Boil, uncovered, for 5 minutes or until reduced by half. 3 Return mushrooms to cooker with garlic, thyme, rosemary, paprika, bay leaves, mustard and worcestershire sauce and stir to combine. Cook, covered, on HIGH, for 2 hours. 4 Combine crème fraiche and flour in a small bowl. Stir in crème fraiche mixture into mushroom mixture. Increase heat to HIGH on reduce setting and simmer, uncovered, for 10 minutes or until sauce thickens. 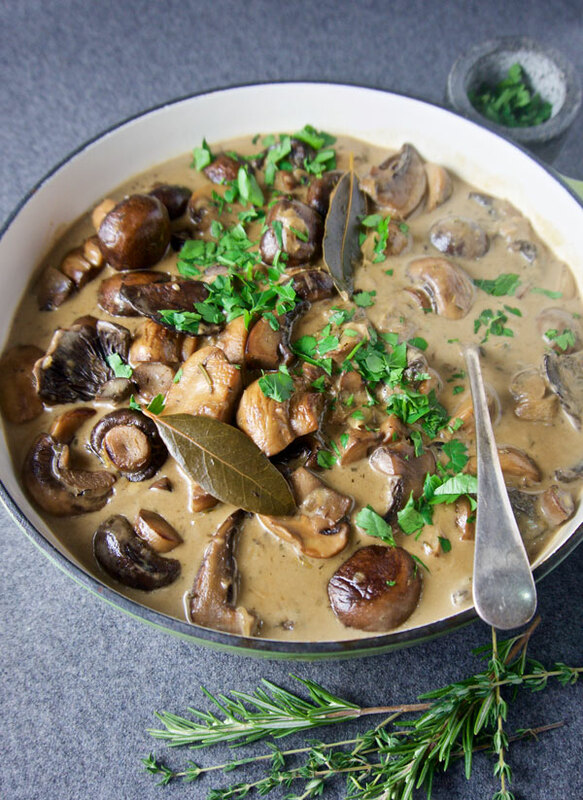 Serve stroganoff sprinkled with parsley.